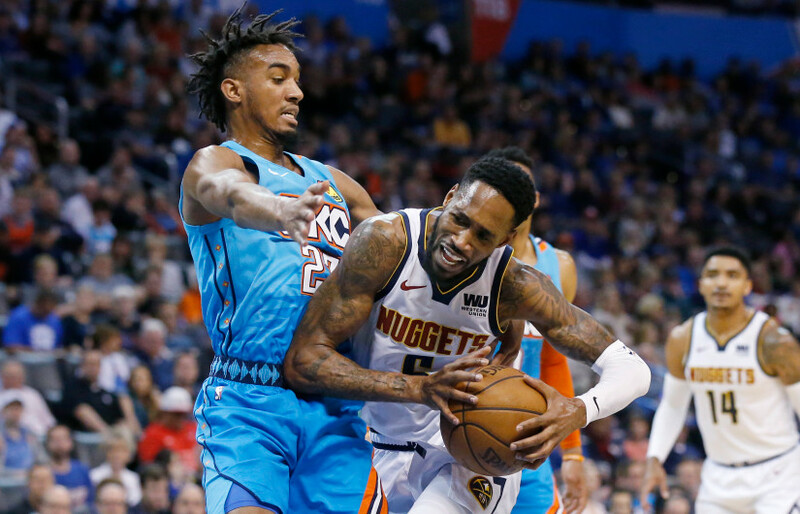 Denver took out their brooms Friday night in OKC as the Nuggets racked the Thunder 115-105 to complete a four game sweep in the 2018-19 regular season. It was a close game until the Denver squad broke a third quarter 70-70 tie and dominated the final minutes of the third and the complete fourth quarter. As any fan knows, basketball is a team game. It might behoove the Thunder that someone please tell OKC head coach Billy Donovan that ISO ball (when a player takes it on himself to be the primary scorer on a ball handle) is not better than team ball when team ball is played right. ISO ball is good with Russell Westbrook and Paul George but team ball is better when it is played correctly. Denver plays great team ball and just check the assists they had and you can see a significant difference tonight. OKC needs to work at playing a well rounded game on offense if they want to get better. Even is the talent is better for the team on Reno Street than in the Mile High City which I think it is, team play trumps the game and works in bringing about wins. why would they not give incredible effort? They were well paid for their work were they not? There are no players on the Denver roster that are better in this sport than Russell Westbrook and Paul George. That is disheartening. And the fact that Denver will get better in the next few years should have Thunder fans wondering where OKC is heading. That is the way I see it sports fans. Fred Pahlke, an Oklahoma native has viewed over 10,000 sporting events in his 65 years. A season ticket holder of the Oklahoma City Thunder, former season tickect holder for the Oklahoma Sooners, Oklahoma City University Chiefs/Stars, he is an expert in both professional and college basketball and football. A high school athlete at Classen High School in basketball and tennis, he played amateur tennis after high school in the Missouri Valley Tennis Association. A graduate of Oklahoma City University, he taught in the public schools for 6 years before becoming a building administrator in the Oklahoma City Public Schools for 31 years, 28 as the Principal of various schools in the district. He has guided various high school and college athletes in his time as an educator and coach. Fredsportsextra has recorded 101, 410 article views in its first ten months, from August 2015 through May 2016.